Where I live, we have raised the art of parking lot running to a high art. There was progress through this week. We are now moving deep snow previously covered in a frozen ice coating compliments of an ice storm preceded by a snowstorm. 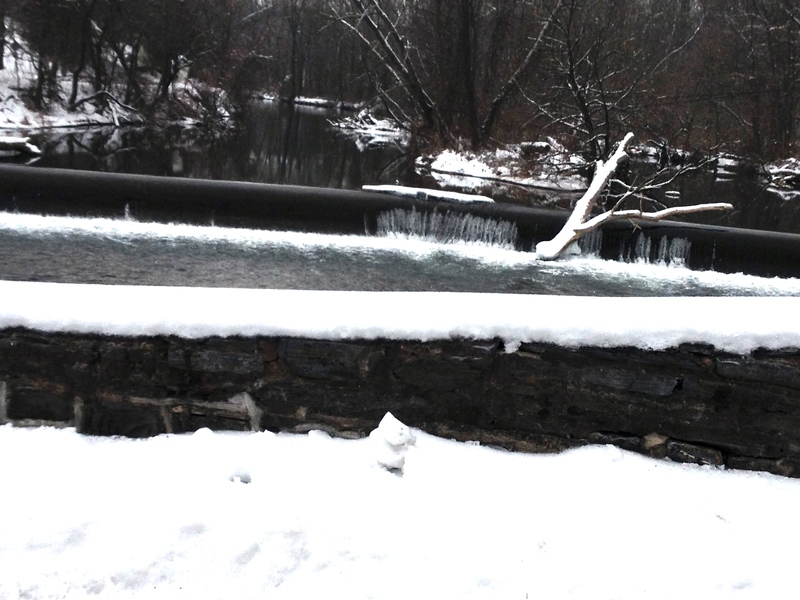 Where I live, temperatures finally rose above freezing, sending rivulets of water across the roads and trails only to refreeze, leaving drivers and runners in for unpleasant early morning slippery surprises. Where I live, long runs have included sidewalks, crusted over roadways and any moderately well-cleared side street that can be found. My reroutes bring me upon some interesting and sometimes quirky sites. 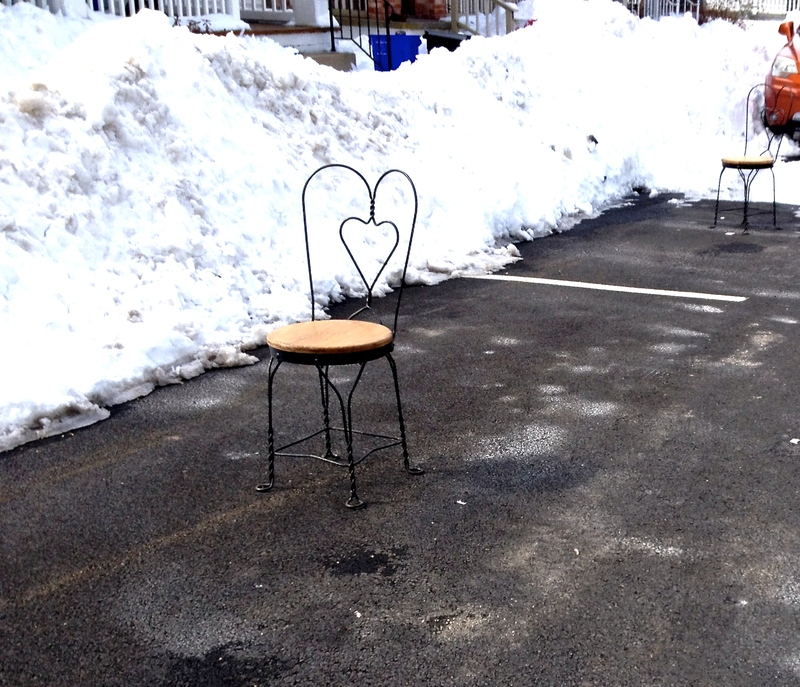 The weekend after Valentines Day, I laughed seeing these heart-shaped wrought-iron backed patio chairs, a cut above the usually plastic chairs set out as placeholders in the “I shoveled it out – it’s mine” parking space wars. Where I live, our brief respite from the frigid temperatures gave residents and municipal services an opportunity to, well, rearrange the snow. As I did a 10-mile MP run, homeowners were out with shovels claiming the pieces of sidewalk and driveway previously sitting under ice sheets several inches thick. I dodged municipal trucks as they cleared out more spaces by moving truckloads of snow to who-knows-where. 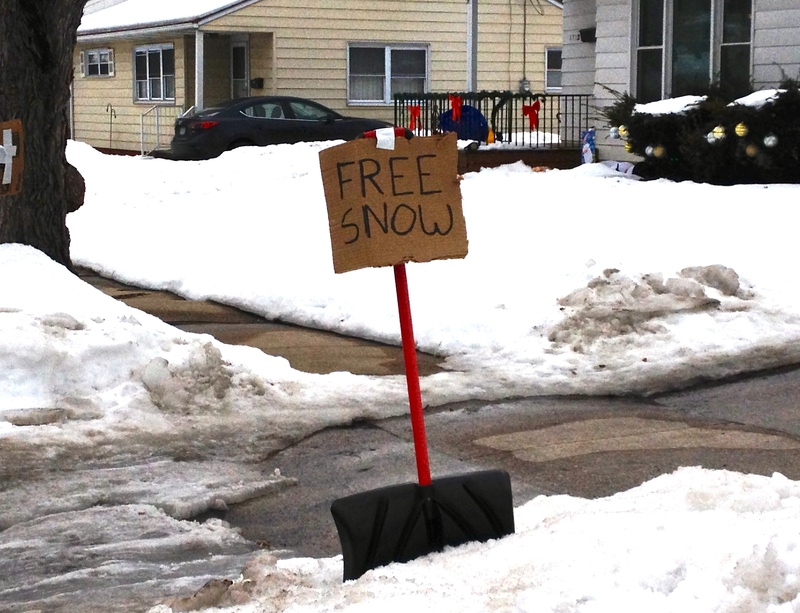 Where I live, a sense of humor about the long tough winter is important. Where I live, many of my boomer buddies have vacated until Spring, taking the opportunity when airports are open to escape to Florida, the Caribbean, Hawaii. I’m sticking it out. The beauty of winter is worth the inconvenience. And this is where I live. You sure do. I’ve followed your weather and it has been no more forgiving. Congrats to Canada on your success in the Winter Olympics. Such a thrill to watch athletes at the top of their game. With a spring marathon planned, I face the elements or face the treadmill. I’m looking forward to a brief stop in Scotland this summer to experience some of your weather. It does seem to be a Northeast phenomenon. 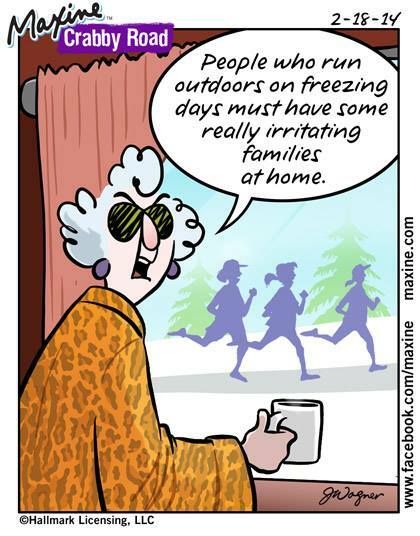 Love the Free Snow sign, and the Maxine cartoon, too (which I will be sharing on my own blog). Thanks! Yes, Maxine always has that small sliver of truth. Loved the blog. As you know, me and Maxine have something in common. Can’t get me out on the streets below 30 degrees. Saturday may be your opportunity. Miss having you out there more frequently (except at competitive 5K’s of course).